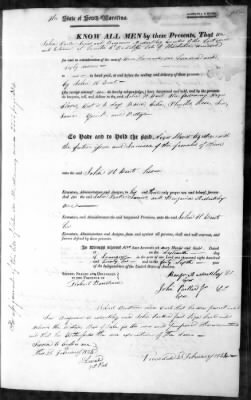 The estate inventory of Lucretia Radcliffe, made in Dec 1821, lists the names of 277 slaves on three plantations in St. Bartholomews Parish, Colleton County, SC. Many of the enslaved in the estate were sold in 1821, 1822 and 1823. Some of the bills of sale reveal the family relationships of those who were sold. We invite you to contribute images, stories, information and comments to this page. This document was indexed and made searchable by Sandra J. Taliaferro. To view the documents, please click on the images attached to this page. The estate inventory lists 277 slaves at Almonbury, Cockfield and Harrisons plantations of Lucretia Radcliffe. It does not reveal which enslaved families were on which plantations. · Peter - 6 mo. · Dorcas - 10 mo. Many of the slaves in Lucretia Radcliffe's estate were sold between 1821 and 1825. Some of the bills of sale for the estate reveal family relationships among those who were sold. 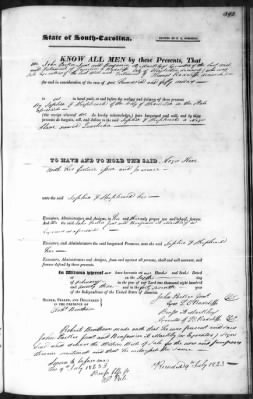 The bill of sale for 5 enslaved ancestors sold to Thomas S. Grimke on 13 July 1821 reveals that they are three generations of a single family. 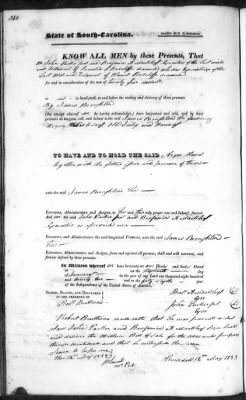 On that day, Grimke purchased "Peter & his wife Sophy and their two children called John & Nancey and their grandchild named Eliza the daughter of Nancy" from the estate. To view this document, please click on the image attached to this story. The bill of sale to Robert Boyce reveals that 5 slaves he purchased were a single family: "Rachael and her children Margaret, Lizzy, Ned and William." The bill of sale also states that Rachael was mulatto. You can view the document by clicking on the image attached to this story. 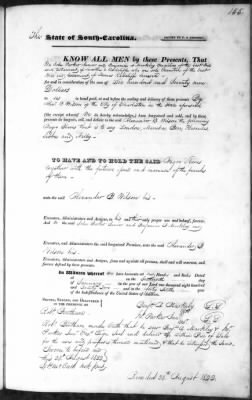 A bill of sale filed 7 Jan 1825 records Alexander B. Wilson's sale of 69 enslaved ancestors to Lionel H. Kenedy. The slaves sold to Kenedy appear to be the same slaves purchased by Alexander B. Wilson from the estate of Lucretia Radcliffe. The first 63 names on the above list correspond precisely to the list of 63 slaves Alexander B. Wilson purchased from the estate of Lucretia Radcliffe on 8 Aug 1822. The names are listed in precisely the same order. 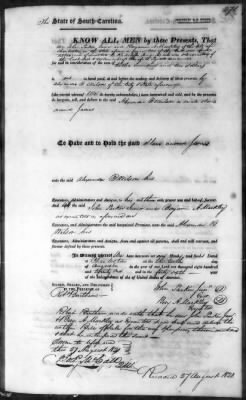 "... in trust nevertheless to and for the uses and purposes and subject to the same power of revocation and declaration of uses as are limited and expressed in a certain Indenture or marriage Settlement bearing date the sixteenth day of November one thousand eight hundred and sixteen and made between Alexander B. Wilson of the first part Sophia Frances Perry Sheppard and Wm. H. Gibbs of the second part and William Trescot of the third part & duly in the office of the secretary of State in Charleston in Book Marriage Settlements numbered No. 7 page ninety." The above reference to a specific marriage settlement in 1816 opens windows for further research. The book The Buildings of Charleston: A Guide to the City's Architecture states that Sophia Frances Perry Shepheard, the great-niece of Thomas Radcliffe, married Alexander B. Wilson in 1816 . Poston, Jonathan H. 1997 The Buildings of Charleston: A Guide to the City's Architecture. Columbia: University of South Carolina Press. Sophia Shepheard purchased 50 enslaved ancestors from the estate in 1823. 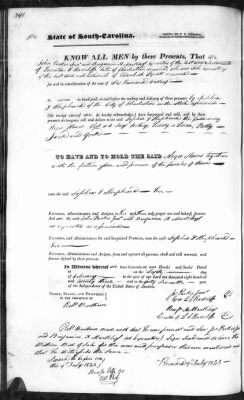 In February of 1824, John H. Dent purchased 8 enslaved ancestors from the estate. You may click on the image attached to this story to view the bill of sale. 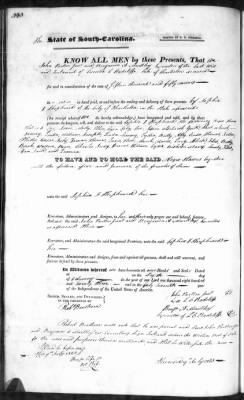 A bill of sale for a slave in the estate of Elizabeth Piatt suggests that Lucretia Radcliffe was the Executrix of the estate of Elizabeth Piatt (Pyatt). John Ashe purchased 5 enslaved ancestors from the estate in July of 1821. James Broughton purchased Old Judy and Nanny on 12 May 1823. Sophia Shepheard purchased Quasheba in July of 1823. She purchased several others from the estate (see stories on this page). The new free Footnote collection SC Estate Inventories and Bills of Sale contains estate inventories which span the years 1732-1872. Through your generosity as volunteers, we have been working since July to index the estate inventories. The inventories are already opening incredible research windows for discovering enslaved and free South Carolina ancestors. We have now started indexing the bills of sale in the collection, which span the same years as the estate inventories. Even at a first glance, we are amazed at how they mesh with the estate inventories and provide additional information and leads for further research. 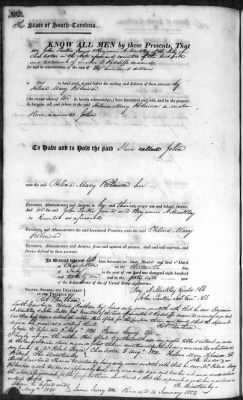 From the estate inventory of Lucretia Radcliffe (above), indexed by Sandra J. Taliaferro, we learned the names and ages of 277 enslaved ancestors on three plantations in Colleton County, SC. 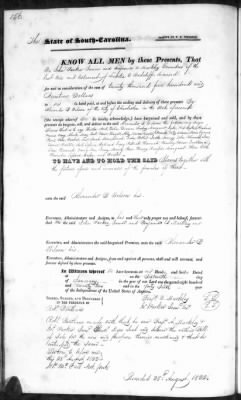 The bills of sale for enslaved families sold from the estate reveal many more details about the slaves and slaveholders named in the inventory. 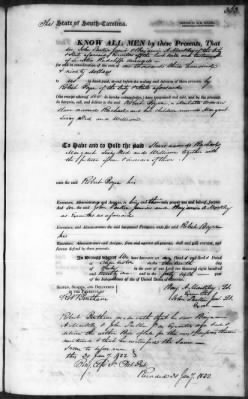 Remarkably, the bill of sale to Thomas Smith Grimke reveals that the enslaved ancestors he purchased in 1821 were three generations of a single family: "Peter & his wife Sophy and their two children called John & Nancey and their grandchild named Eliza the daughter of Nancy." 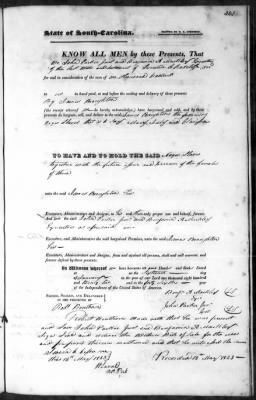 The estate inventory includes 15 slaves belonging to the estate of Elizabeth Piatt (also rendered Pyatt, Pyeatt). 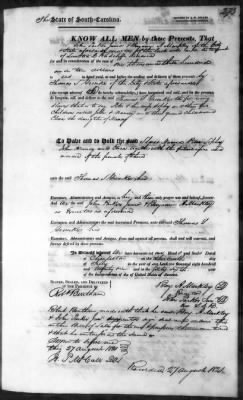 Bills of sale reveal that Lucretia Radcliffe was the Executrix of Piatt's estate. 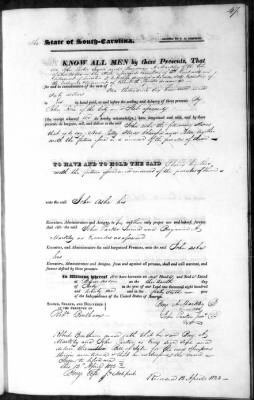 We learn from bills of sale that Alexander B. Wilson purchased 69 slaves from the estate in 1822, and subsequently sold 69 slaves to Lionel H. Kenedy in 1825. The bill of sale to Lionel H. Kenedy also suggests that there were family ties among Lucretia Radcliffe and Sophia Shepheard and Alexander B. Wilson (two of the purchasers from Radcliffe's estate), and includes a specific reference to the book and page number of a marriage settlement filed in 1816, 9 years before Kenedy's purchase. The estate inventories and bills of sale in this free Footnote collection are each remarkable in their own right, but together they open important windows for further research. And it is your volunteer efforts that are bringing these incredible records into the historical light. We at the Restore the Ancestors Project thank you from the bottom of our hearts for what you are accomplishing, and we know the Ancestors must be smiling. We wish you a joyous holiday season!